Virginia touts itself as being “for lovers,” but it turns out that it’s for kids, too! Virgina is home to some of the country’s most kid friendly museums. Here are seven of Virginia’s best museums for kids and families. 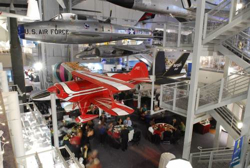 In 2009, The Virginia Air & Space Center received Nickelodeon’s Parents Connect Parents Pick awards in the categories of Best Day Camp and Best Kids’ Party Place. It features the Adventures in Flight and new Space Quest galleries along with more than 100 hands-on exhibits that tell the story of air and space exploration. See the Apollo 12 Command Module, a Mars meteorite, a three-billion year-old moon rock, and so much more!